If everyone in Europe was an eco-driver we could apparently save the equivalent of the annual CO2 emissions from Portugal! 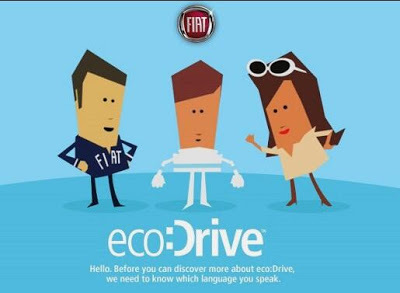 The Eco-drive gizmo is only available on Fiat cars – but that doesn’t mean you can’t put the ideas into practice when driving other cars. If you are a Fiat driver, you’re given a USB chip, which is inserted in the car before each trip – then the details of your journey are uploaded onto your computer afterwards. The Eco-drive website will then tell you how well you’ve driven and how you might improve your eco-efficiency. When I test drove a Fiat with the Eco-drive system, I was very interested to see how I’d done – and there was room for improvement. But after a few days the novelty wore off – and the advice didn’t change much – so I didn’t keep it up. The Fiat team said that there were plans to give live advice as you’re driving but I didn’t get the feeling that they were in a hurry to do this. And I don’t think they’ll get very far if they don’t! One of the other problems they’re facing is consumer attitudes. Apparently, people are much more open to the idea of buying a smaller, more eco-efficient car, than they are to driving more efficiently. Yet, changing driving habits would bring an immediate reduction in CO2 emissions, as opposed to a very slow one if we wait for everyone to replace their cars. At the Fiat event there was a presentation from the AA. They said that they’d saved a fortune by getting drivers to turn off their engines, rather than leave them idling when they weren’t going anywhere. This is a common problem. Buses are particular culprits – and I’ve noticed the taxi drivers at Yeovil Junction – my local station – sit for hours with their engines running. I’ve find myself longing to turn off their ignitions! Another speaker talked about giving drivers – particularly commercial ones – incentives to drive better. Apparently, in Japan the best eco-drivers of HGVs are in high demand and so get better paid. Fleet drivers too could be monitored for eco-driving and given rewards for good performance. I think Fiat have hit on a good idea. And they’re clearly keen to promote it. But the biggest challenge is going to be getting many more people onto eco-driving – even when they don’t have a gizmo to tell them what they’re doing wrong! This entry was posted in BLOG, Business, Media & Communications, News 2010, Technology & Design, Transport - Road, Rail & Air. Bookmark the permalink.